You will love these roasted Portuguese chicken steaks with lemon (bifes de frango com limão), they will be crispy on the outside and juicy in the inside. In a bowl, add the juice of the 2 lemons (save one lemon), add a tablespoon of olive oil, oregano, rosemary and salt (to taste). Add the chicken to the marinade and let it sit for an hour in the refrigerator (cover the bowl with plastic film). After an hour, in a different bowl, mix the breadcrumbs and the yellow corn flour. Drain the liquid from the marinade with the chicken, add the steaks to the breadcrumbs and corn flour mix and move it around so they are well coated with it. 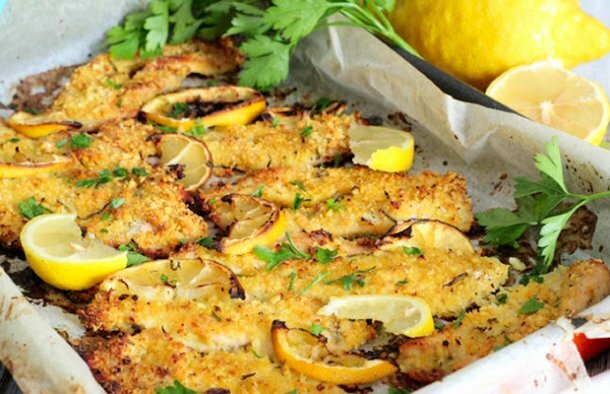 Place the chicken steaks on a baking sheet lined with paper and a little olive oil and sprinkle the steaks with a little oregano, rosemary, salt, pepper and place slices from one of the two sweezed lemons on top. Bake in a preheated oven at 180°C or 350°F for about 25 minutes. 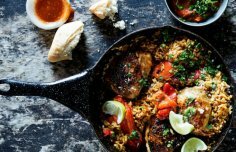 How to make Portuguese chicken and char grilled red pepper paella with fresh lime. 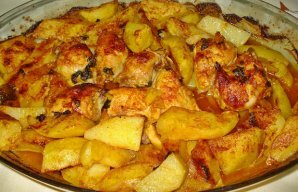 This Portuguese roasted chicken with chouriço recipe doesn't take much time to prepare and makes a delicious meal. 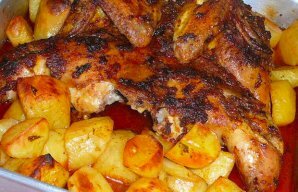 Serve this amazing Portuguese roasted chicken and potatoes (frango assado com batatas) with a salad.